Bringing a new dimension to biology. The Allevi 2 is the world's first desktop 3D bioprinter that prints living tissue out of human cells. It is a beautifully designed, precision manufactured 3D bioprinter that prints cells and bioinks. The Allevi 2 bioprinter uses visible blue light or UV light to cure biomaterials rapidly without damaging cells. The Allevi 2 bioprinter includes two heated extruder heads, with temperature control ranging from room temperature to 70°C and 160°C. The cartridge houses two disposable BD syringes, making it easy to switch between materials and ensure sterility. Users can choose any bioink that can be extruded from a syringe - the choice is yours. The Allevi 2 bioprinter is the world's first desktop 3D bioprinter. With a measurement of only 12 inches cubed, Allevi 2 was designed to fit into any bio-safety hood to ensure the system is easy to use and easy to sterilize within your existing work environment. 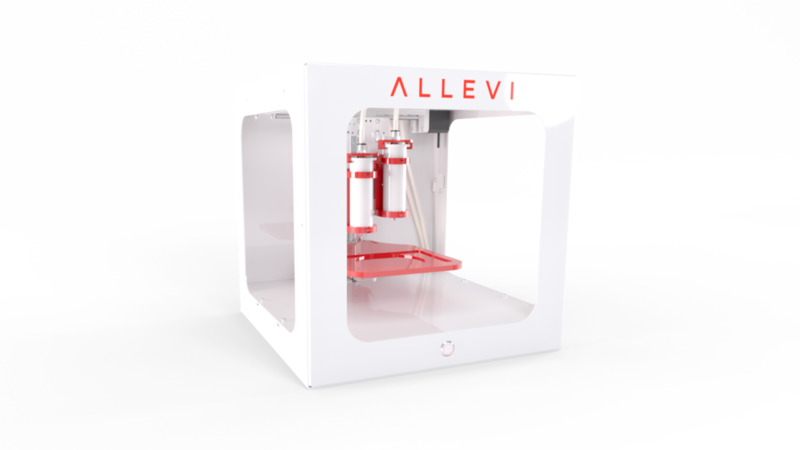 We designed the Allevi 2 bioprinter to be the most accessible 3D bioprinter in the world. It is easy to upload designs, choose biomaterials, and print tissues. We support the use of standard lab dishes, whether that’s circular petri dishes or 96 well plates. Whether you are an undergrad or principal investigator, the Allevi 2 will accelerate the pace of your research. Allevi 2 bioprinter runs off of a compressed air pneumatic system, making it very easy to achieve clean starts and stops in printing. Pressure ranges between 0 and 120 PSI accommodate a wide range of viscous materials. Our team of engineers has worked hard to ensure precision in every aspect of Allevi 2. We use linear rails over less expensive belt systems that slip and require adjustment, guaranteeing a consistent 10 micron precision on each axis. Thank you for your interest in the Allevi 2 bioprinter! A member of the ATeam will get back to you shortly.